How does Folder View work? Most computer users use one main location where they store most of their files: My Documents. Often, My Documents contains many sub-folders containing other sub-folders. This structure makes it quite a hassle to get to the right location when opening or saving files. But that's not all: most of the time, one or two often used folders are for technical reasons not located inside My Documents, but somewhere else. A network location with global company files, an MP3-folder on a different harddisk, or a removable drive. Reaching all these different folders takes a lot of time. Folder View adds a toolbar to the Windows Explorer. With this toolbar, you can navigate to every folder you use often in a single click. Every folder you like can be added, no matter where they reside: on the harddisk, a removable drive or the network (local, ftp, web-share). Folder View integrates with common Open/Save dialogs; giving you quick access to your folders from within almost all applications. The menu has the same structure as the toolbar in Explorer. 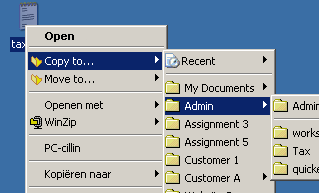 Folder View also updates the locations on the left side of the dialog to the folders you most recently used (in Windows and Office 2000/XP). Folder View integrates with the right-click menus of files, allowing you to copy and move files and folders extremely quickly. 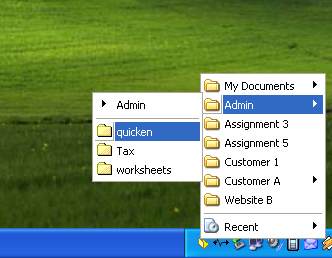 Folder View puts an icon in your system tray (near the clock), from which you can quickly launch all folders you use often, using the same menu-structure as the toolbar. And the bonus is: the recent folders menu. 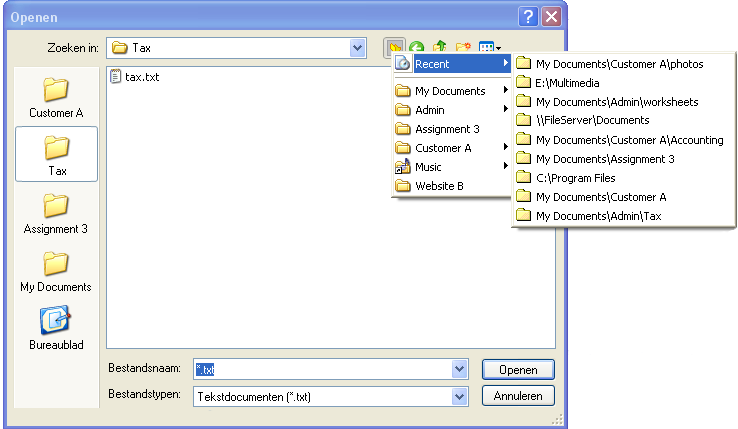 The toolbar and the three menus all contain a special 'Recent Menu', which remembers your most recently used folders. This menu makes it for example very easy to reopen a folder you accidentally closed. Or to save a file inside the last folder you opened. Or to move a file to the last folder you accessed. Very quickly.